Among the great figures of Progressive Era reform, Edith and Grace Abbott are perhaps the least sung. Peers, companions, and coworkers of legendary figures such as Jane Addams and Sophonisba Breckinridge, the Abbott sisters were nearly omnipresent in turn-of-the-century struggles to improve the lives of the poor and the working-class people who fed the industrial engines and crowded into diverse city neighborhoods. Grace's innovative role as a leading champion for the rights of children, immigrants, and women earned her a key place in the history of the social justice movement. As her friend and colleague Eleanor Roosevelt wrote, Grace was "one of the great women of our day ...a definite strength which we could count on for use in battle." 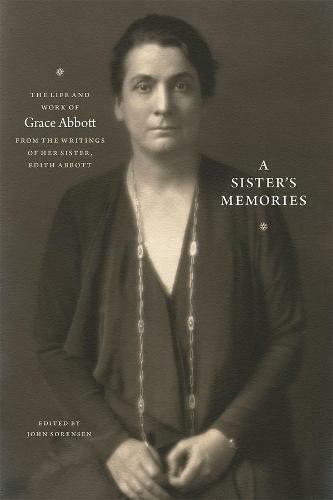 A Sister's Memories is the inspiring story of Grace Abbott (1878-1939), as told by her sister and social justice comrade, Edith Abbott (1876-1957). Edith recalls in vivid detail the Nebraska childhood, impressive achievements, and struggles of her sister who, as head of the Immigrants' Protective League and the U.S. Children's Bureau, championed children's rights from the slums of Chicago to the villages of Appalachia. Grace's crusade can perhaps be best summed up in her well-known credo: "Justice for all children is the high ideal in a democracy." Her efforts saved the lives of thousands of children and immigrants and improved those of millions more. These trailblazing social service works led the way to the creation of the Social Security Act and UNICEF and caused the press to nickname her "The Mother of America's 43 Million Children." She was the first woman in American history to be nominated to the presidential cabinet and the first person to represent the United States at a committee of the League of Nations. Edited by Abbott scholar John Sorensen, A Sister's Memories is destined to become a classic. It shapes the diverse writings of Edith Abbott into a cohesive narrative for the first time and fills in the gaps of our understanding of Progressive Era reforms. Readers of all backgrounds will find themselves engrossed by this history of the unstoppable, pioneer feminist Abbott sisters. "Edith Abbott left behind an unfinished memoir-biography of the life and work of her brilliant younger sister, Grace, the prominent Progressive advocate for immigrants and children. It has been Sorensen's inspired and skillfully executed task to complete this biographical project, working with the incomplete text and the author's fragmentary notes and rough drafts. Intended solely for the general reader, and thus free of footnotes or annotations, this lively and well-written book is just what we need to improve the lives of immigrants and children today--a guide to the best arguments and strategies, as captured in Grace Abbott's remarkable story." --Louise W. Knight "author of Jane Addams: Spirit in Action and Citizen: Jane Addams and the Struggle "
Edith Abbott left behind an unfinished memoir-biography of the life and work of her brilliant younger sister, Grace, the prominent Progressive advocate for immigrants and children.It has been Sorensen s inspired and skillfully executed task to complete this biographical project, working with the incomplete text and the author s fragmentary notes and rough drafts. Intended solely for the general reader, and thus free of footnotes or annotations, this lively and well-written book is just what we need to improve the lives of immigrants and children today a guide to the best arguments and strategies, as captured in Grace Abbott s remarkable story. --Louise W. Knight "author of Jane Addams: Spirit in Action and Citizen: Jane Addams and the Struggle ""